People, allow me to gloat and enjoy my VD this year. Last year I was depressed, my doctor told me I had the classic symptoms of depression. From December to Febuary I was down in the dumps. My favorite past time then was sleeping inside my brother's room during the daytime, keep the lights off, TV on but on mute. This year, my Christmas and New Year celebration were relatively happier, I had peace of mind and heart. Valentine's Day is even more special. Last time I got flowers on VD was in the mid 90s and from my female students. I don't remember getting anything from any of my past boyfriends. Last time a guy gave me flowers was on my birthday, Dec 2001. I got 12 long stemmed roses, ordered via the internet. Someone from chat sent it to me. Unfortunately, we were never meant to be. This year is special. Right after chatting with S, I got a call from the flowershop asking for directions. S sent me flowers!!! 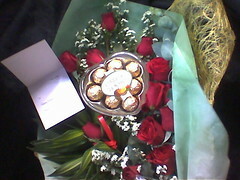 1 dozen long stemmed roses with chocolates and a cute teddy bear. The card was simple, only "happy valentine's day" was written there. Kilig ako! Thanks S! You made my VD very special, you made me feel very special. Jelling ako! HEHEHE! Happy V-Day. Wak ka jelling... Puwede ka rin naman mag send ng flowers sa akin, kahit cauliflowers puwede! Hehhehe! Happy VD! wow ms fionski...nice smile with all those lovely roses. hapi valentine's friend! hehehe big beautiful smile. Nakakainggit naman si S.
Haven't blog-hopped in a long time. 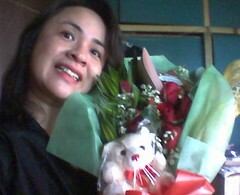 Good to hear you had a great valentines :) I oh-so love flowers! Hello Ate Fionski! You look ecstatic in the photo. Belated Happy Valentine's! The best of love and health to you! Happy Valentines Day. Just blogging around and promotinmg my new forum site. on lovapalooza... i thought we already broke the record last year? or did they set another world record?